The holiday season is in full swing and eating healthy might get thrown on the back burner because things get busy. 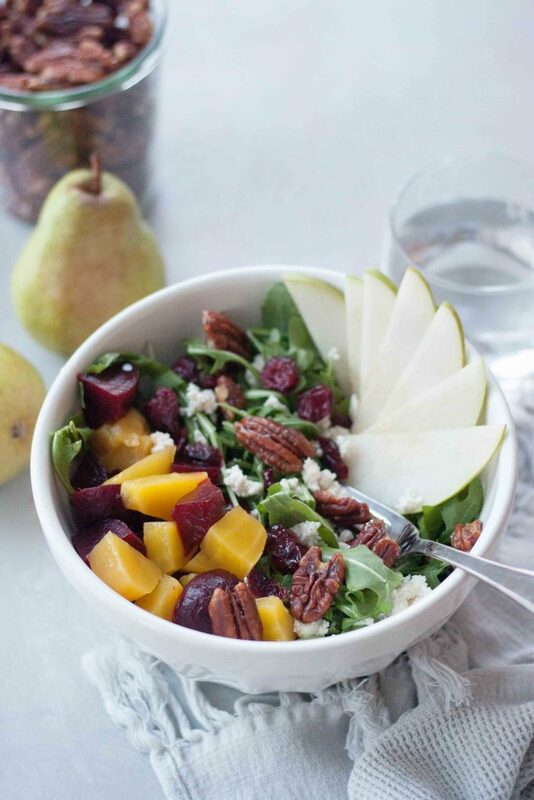 This simple Beet Pear and Maple Pecan Salad is so easy and packed with flavor it’s perfect for weeknight, the weekend with a glass of wine, or even your holiday party! Yes you can even make the Candied Maple Pecans and still have this on the table in less then 15 minutes! I love a good salad and to me that’s one packed with flavor, texture, and nutrition. Anything but a “boring salad”. I’m still really curious what’s in these boring salads people eat because mine are always far from boring. I like to use seasonal produce, since it not only tastes the best is easy to get my hands on and keeps things interesting. Come fall and winter I love packing in the apples, pears, cranberries, pomegranates, citrus fruit, beets, and squash. This salad uses a few of those and more. 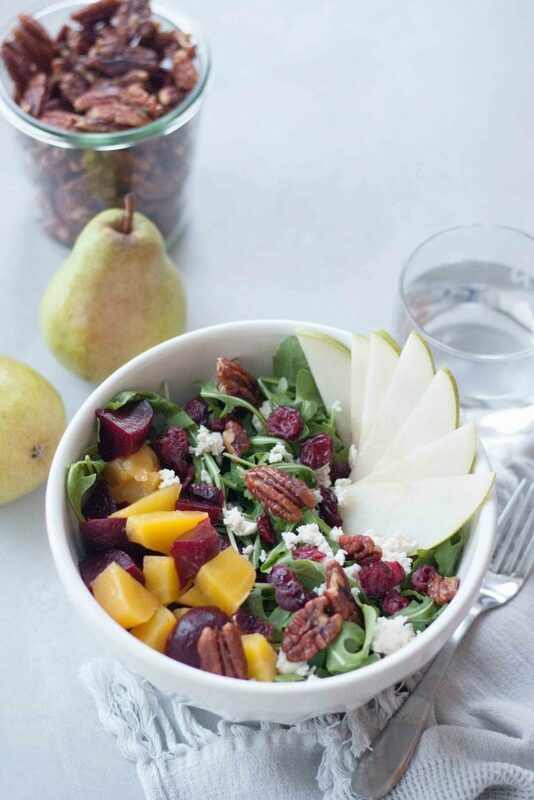 As I said this Beet Pear and Maple Pecan Salad can be pulled together in less then 15 minutes! 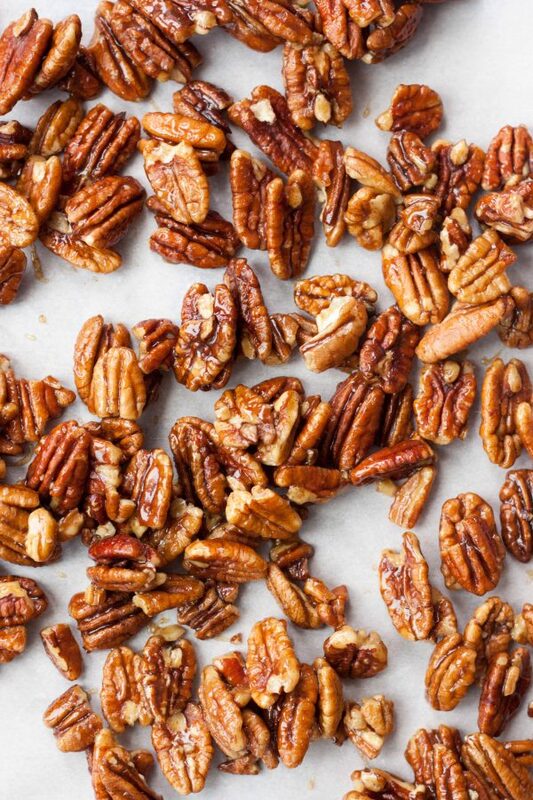 First start by making the pecans so they have a little time to cool, they take less then 5 minutes and while they cool you assemble the rest of the salad. To make it quick and easy either purchase already cooked beets, like Love Beets, or Trader Joes carries regular ones as well as golden ones now already roasted! Otherwise you can batch cook them ahead if you do meal prep. I do this when we have a lot in our garden, which we had our best beet year ever I think this year. You can use all one color I just like to add fun with both colors. Slice or chop your pear and you’re ready to assemble your salads. I like to use arugula in this one but if you aren’t a fan of it’s mild peppery taste you can use spinach or another green. I like to rotate my greens to keep things fun and change up the nutrition profile. You can either toss your greens with a little balsamic vinegar or dressing or drizzle it over the top. Top your greens with beets, pears, crumble on some ricotta (I use dairy free/vegan Kite Hill if you aren’t dairy free you might also like feta in this salad or a creamy goat cheese), sprinkle with dried cranberries and last the Candied Maple Pecans! So many flavors and textures it’s far from boring! As I said above you can sub another cheese, if you have apples you want to use up you can use them in place of pears as well. For dressing I typically make my own (balsamic vinegar, oil, salt and pepper) or use straight balsamic which I did in this case using a Cranberry Pear White Balsamic Vinegar. You can also use any balsamic style dressing you like or have on hand. This makes a quick and easy healthy weeknight meal or is even fancy enough to impress dinner guests or bring to a holiday gathering. I made the recipe for 2 but it’s easy with the quantities to increase for 4, 8, or more! Serving is for a dinner salad, if serving as a side or at a gathering it would be 4 servings instead of 2. While I was craving a salad when I threw this together I was also secretly looking for a way to enjoy more of the Candied Maple Pecans that I already ate too many of that weekend. Throwing them on this salad that I throw together often brings it to the next level as well as mixing up the greens. If you like salads like this search the blog as I have many more like it with beets, pears, apples, oranges, ect. Just search beet salads, pear salads, another ingredient you love, or just salad. As far as the Candied Maple Pecans, they disappear as fast as you make them if you share them with friends, or hoard for yourself. Perfect for the holidays and adding to pretty much anything. While the recipe for them below makes about 2 cups you only use 1/2 a cup in this salad. I have a couple other recipes that use them as an option which I will link back here and will add to this post as I share them. I’m also working on another one. I’m sorry in advance if you become as addicted to them as everyone I’ve shared them with. I can’t even tell you how many times I’ve shared the recipe for them. 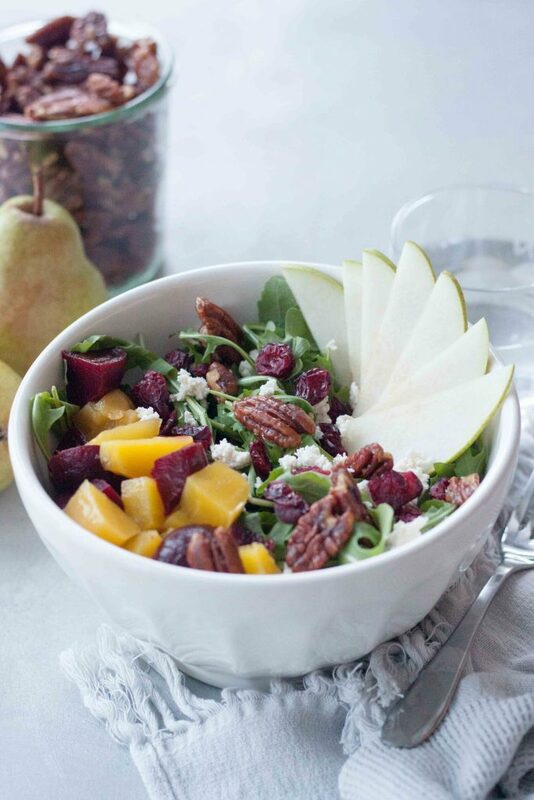 Delicious seasonal Beet Pear and Maple Pecan Salad is packed with flavor, texture, and nutrtion. Great for a quick and easy weeknight dinner or impress dinner guests or serve at a get together. Gluten free and vegan friendly. Cook Candied Maple Pecans as directed below. Chop or slice beets and pear. If making individual salads divide arugula between bowls, otherwise place in a large bowl. Toss with vinegar or dressing, unless serving or topping with it. Top with pears, beets, crumbled ricotta (or cheese as noted above and in notes), dried cranberries, and Candied Maple Pecans. Serve with vinegar/dressing if greens are not already dressed. If you don't have or don't care or the mild peppery taste of arugula you can substitute baby spinach or another green of choice. An apple can be substituted for pear. If not dairy free feta or a creamy goat cheese can be used. A balsamic vinegar or balsamic dressing can be used. I prefer vinegar (Cranberry Pear White Balsamic Vinegar was used in this one) or a simple dressing with balsamic, extra virgin olive oil, sea salt and pepper. Simply delicious Candied Maple Pecans are pecans coated with a sweet chewy maple coating. Gluten free and vegan these nuts are a healthy treat and addicting! In a cast iron skillet over medium heat melt the coconut oil. Once melted stir in maple syrup with a wooden spoon or spatula until it starts to bubble and get kind of foamy looking. When it starts to bubble and get a lighter color and look kind of foamy, takes about 2 minutes, add in the pecans. Stir pecans gently to coat. Sprinkle with a pinch of cinnamon and give them one last mix. Pour and spread the pecans out on the prepared baking sheet. Let cool for a few minutes before enjoying. If placing in a container let them cool completely before putting in a sealed container. 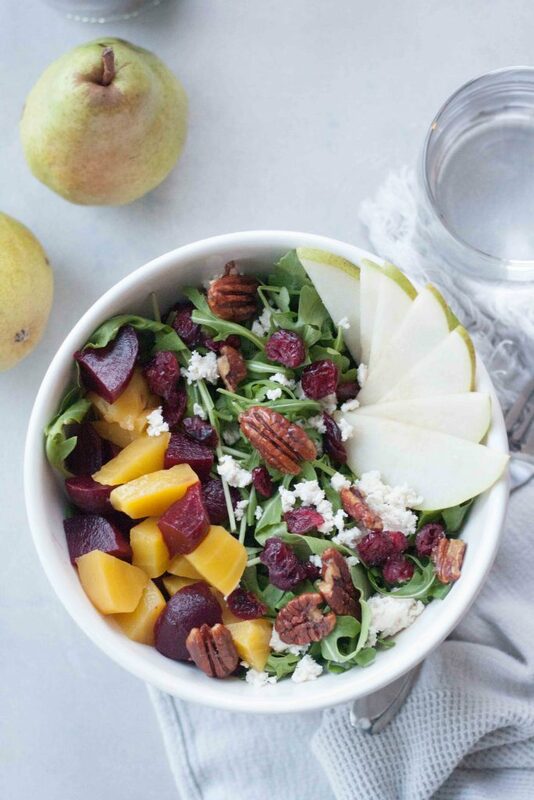 I love the idea of pairing beets and pears! The color and the flavor combo sounds amazing! Beets are always a good idea, and tis the season! I LOVE salads that combine different fruits and nuts. And beets are THE BEST! Beets are the best and the pecans are right up there! I’ve never thought to pair the beets and the pears! 2 of my favorite salad items together yum. And I need to make some more spiced nuts! They’re a great combo, you’ll have to try them togehter and the Candied Maple Pecans are NOT optional! I got lost in this recipe…lost in thinking about making it and how delicious it will be! Thank you, I feel the same way with every bite! This is the perfect winter salad both aesthetically and balance of flavors. I’ll be looking for some colored beets next trip to the store! Thank you! You can buy golden beets at many stores but pre-cooked golden beets I’ve only seen at Trader Joes. I love fruits in my salads– this is so wintry and beautiful! Thank you, it’s a flavor packed combo! This looks like such a delicious salad!! Love a good salad – I also can’t understand why people would think a salad can be boring! The options are endless. The beets add such a lovely colour. Every single ingredient in this salad is one of my favorites. I love how you pulled it all together. this is one hundred percent my kind of salad – I could eat this way every single day! There is nothing boring about this gorgeous salad! Alisa Fleming recently posted…The World’s Easiest Dairy-Free Fudge: Just 4 Ingredients! I love hearty salads like this! Looks absolutely delicious!